Optimal working dilutions should be determined experimentally by the investigator. Suggested starting dilutions are as follows: WB (1:500-1:2000), ELISA (1:40000). Not yet tested in other applications. Fig.1. 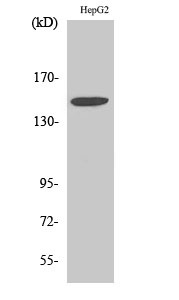 Western Blot analysis of various cells using Integrin α3 Polyclonal Antibody diluted at 1:2000. Fig.2. 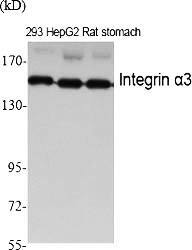 Western Blot analysis of HepG2 cells using Integrin α3 Polyclonal Antibody diluted at 1:2000. 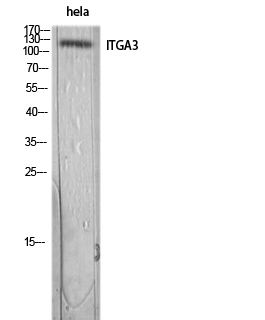 ITGA3 encodes a member of the integrin alpha chain family of proteins. Integrins are heterodimeric integral membrane proteins composed of an alpha chain and a beta chain that function as cell surface adhesion molecules. Integrin alpha-3 is proteolytically processed to generate light and heavy chains that comprise the alpha 3 subunit. This subunit joins with a beta 1 subunit to form an integrin that interacts with extracellular matrix proteins including members of the laminin family. Expression of this gene may be correlated with breast cancer metastasis. Integrin α3 Polyclonal Antibody detects endogenous levels of Integrin α3 protein.